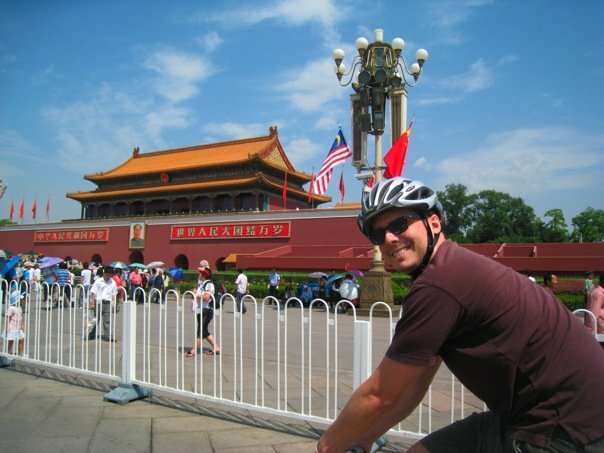 The author bikes through Tiananmen Square on a blue sky day. On August 8, 2008, I was in Beijing reporting on the media aspects of China’s first Olympic Games, and I am still amazed that the four-hour opening ceremony, as designed by film director Zhang Yimou, was seen by sixty-nine percent of China’s television audience, or roughly 842 million people. I watched the Olympic procession and the 10,000-person precision song and dance show from a packed rooftop party with a big-screen television in place and a clear view over the North Second Ring Road. The fireworks from the “Bird’s Nest” National Stadium in the distance split the air like lightning rising from the ground up. It was loud and electrifying, and the shock waves bounced all around us. I remember clearly how that month everybody seemed to smile a lot. Young Chinese volunteers gathered at major intersections offering help in multiple languages to bewildered tourists, who were fascinated that China had suddenly become so modern. By the time the countdown to the Games had come to an end, the capital’s normally sooty skies were beginning to be blue again. With factories shut down and half the cars in the city of 17 million people forcibly removed from the city’s streets, the blue skies would linger for most of the sixteen-day competition—a clean-air streak that has seldom been repeated since. The capital finally had a truly cosmopolitan feel. New Yorkers like me—all of us from all over the world—were now enjoying wandering around Beijing as if we were in Manhattan or Brooklyn. For years, I’d struggled to convey why I felt like such an outsider in China. But for the days and weeks of the Beijing Games, I somehow felt very much at home, and was thrilled that the Chinese seemed to begin to understand why I spoke of home so fondly. In New York, we’re all from somewhere else—not just from the next state, but from neighboring countries and faraway continents. During the Olympics in Beijing, perhaps for the first time in the four years we’d lived there, I felt comfortable in my own New York skin. Having seen that labels like those meant little in the Olympic spotlight, my wife and I decided we should break the four-year pact we’d made in 2004 when we first came to Beijing with a four-month-old daughter. We decided to extend our stay. On the heels of the brilliant success of the Green Olympic Games, as they were called, how could China fail to reward us? We'd been hopeful that the pollution might continue to dissipate, but instead it returned with a vengeance. The fact that we just had to get used to it in a booming Chinese megacity which showed no signs of slowing down began to grind on me personally and professionally. Sure, there was the vastly expanded Beijing subway system, a gleaming network that makes the trains running under New York look positively twentieth century, and the Games brought a flood of money into China and a greater array of culture, food, and music. But with each Olympian step upwards toward a more civilized and worldly way of life, there appeared to be nearly as quick a falling back to the depressing and the humdrum. A few of our Chinese neighbors got rich and escaped overseas, washing their hands of their homeland as too corrupt. Others who couldn’t afford to leave were faced with life in a city whose pollution had grown so bad as to be intolerable. Five years on and the pollution is worse than it’s ever been—among the worst in the world, some say like walking out your door into a forest fire. What a letdown that the promise of the "Green Olympics”—made back in 2001 when Beijing first got the right to host the Games—was fulfilled for just a few weeks, then dashed against the rocks of irresistible economic growth. How can we have had an Olympics and still live this way, some Chinese friends asked? We didn't stick around to find out. Although I had the prospect of an exciting new job in Beijing, we left in December, and were then appalled to read the news back in New York that Beijing’s pollution in January had again broken all records. Now, as Rio de Janeiro, another of the world’s megacities in giant developing economies, prepares for its own Summer Games in 2016, and for the next World Cup of soccer next year, Chinese are also asking: How does the rest of the world do it? And that, right there—China’s curiosity about how the rest of the world works and the confidence to begin to ask hard questions—is the greatest gift the Olympics bestowed on the people of Beijing and China. Just as the world looked in on China in 2008, the Chinese began to stand up and look out of their longstanding isolation. By the same token, anyone who wasn’t already in some way tied to China could no longer ignore it after August 2008. When a nation’s television audience is nearly double the entire population of your country and its immediate neighbors combined, how can you? The Beijing Olympics solved very few problems for China and exacerbated quite a few more, but, if nothing else, the Games finally put China and the rest of the world nose to nose and made way for a recognition at the individual level that people of all nations and Chinese people can all cheer for one another because we all breathe the same air.